The release of the controversial memo is raising more questions about the secrecy surrounding the US administration – Do you every get the truth? On Friday, President Donald Trump approved the declassification of a highly controversial memo, spearheaded by Nunes, that alleges FBI abuses of its surveillance authority. The memo tries to connect what Republicans believe was a flawed application to monitor Page to the overall counterintelligence investigation into potential collusion between Russians and the Republican campaign. 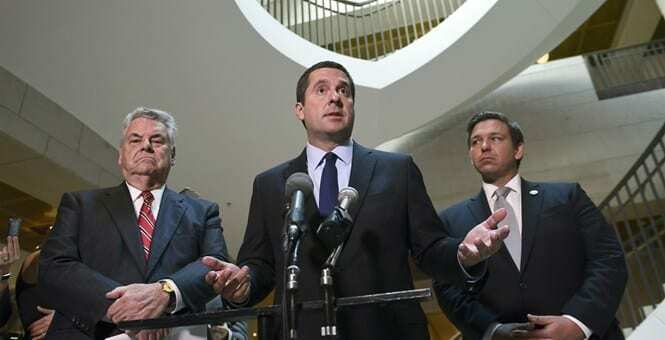 As the story unfolds Devin Nunes, House Intelligence Committee Chairman, hinted Friday that there would be additional memos released regarding the committee’s investigation into alleged abuse of FISA warrants — and the next one may look at the State Department. This memo is the most explicit Republican effort yet to discredit the FBI’s investigation into Trump and Russia alleging that the investigation was infused with an anti-Trump bias under the Obama administration and supported with political opposition research. The FBI had warned against the memo’s release and said key facts had been omitted. Devin Nunes also stated that despite his extensive involvement in the memo, he had not seen the FISA application from the memo released Friday, because of an agreement made with the Justice Department. The public release of the classified document, through a unique and unused House committee rule, will add further tension to the already frayed relationship between the President and his Justice Department and intelligence community. Both national agencies opposed the release of the document, which is based on classified intelligence. The highly controversial memo alleges that then-Deputy FBI Director Andrew McCabe told the committee that no surveillance warrant would have been sought for a Trump campaign aide without a disputed opposition research dossier on Trump and Russia. It accuses the FBI and the justice department of using an unsubstantiated and Democratic-funded report to obtain the warrant that gave permission to spy on an aide to Mr Trump. The memo is seen as the backlash for the FBI’s investigation into Trump, and his administrations dealings with the Russia probe inquiry. And following all the allegations that have surfaced surrounding the Trump administration and his son in Law’s meetings with Russia is the most explicit effort by Trump’s team to discredit the FBI’s findings. Democrats said the release of the memo was aimed at disrupting investigations into alleged links between the Trump campaign and the Kremlin. President Trump has consistently denied any such collusion. At the same time, the committee rejected an effort from Adam Schiff, the leading Democrat on the Intelligence Committee, to also make public a 10-page Democratic counter-memo. The committee voted to release that memo to the full House, and Schiff plans to push for its release next week.